There are natural scenes all around us, but we rarely fully appreciate them. Author and artist Donal Keohane wants to help you perceive the pleasures of life. His second book, Observations Visible and Poetic, is a unique collection of paintings, sculpture, drawing, stained glass, mosaic and poetry that enhances the reader’s awareness of the world around them. Keohane combined natural and personal elements to create this book. The combination of visuals and poetry heightens the reader’s awareness of the natural world. 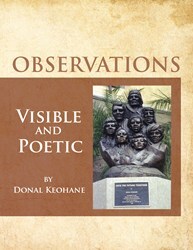 Observations Visible and Poetic is an exceptional collection that helps bring readers to a greater understanding of the vivacity of the world.